A fine arts conservator specializing on murals, paintings, works of art on paper and historic finishes such as decorative paintings and wallpaper. She has more than 25 years of experience working on the field preserving prominent private and public art collections. The Smithsonian Institution and the J. Paul Getty Conservation Institute are among the institutions that have contracted her services. Ms. Dominguez actively seeks to promote preservation through both hand on projects and education. She was responsible for the recovery of the part of the interior of the Lyndon B. Johnson's Summer White House in Texas. Viviana gives lectures in museums and international congress and teaches conservation to her colleagues. Viviana collaborates on large projects with other conservators in the fields of sculpture and architecture in Miami, Baltimore, Los Angeles and Hawaii. She serves the community as an acting team member of NHR (The American Institute of Conservation of Historic and Artistic Works- National Heritage Responders). The team response to the needs of cultural institutions during emergencies and disasters through coordinated efforts with first responder, states agencies, vendors and the public. 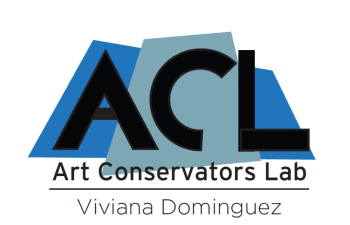 Art Conservators Lab is in Miami, Florida. Dimitra studied conservation of antiquities and works of art in Athens, Greece. She worked at the Byzantine and Christian Museum in Athens, and at the Library of the Hellenic Parliament. This institutional experience involved treatment of objects and works on paper, as well as participation in exhibition installations/de-installations. Dimitra also collaborated with conservators in private practice, where she was involved with the treatment of frescoes on the Metropolis of Amarousio, Piraeus and architectural elements such as the marble exterior surface of the Greek Council State building in Athens. From 2015 until recently she has been a conservator at Caryatid Conservation Services, Inc. where she was involved with treatments of objects, maintenance of outdoor sculptures, surveys and assessments for museums in Florida. Since December 2016 Dimitra is an Associate Object Conservator at Art Conservators Lab, specializing on marble, ceramics, mosaics and metals as well as archeological organic materials. Miss. Solari has an art conservation degree from The Institute for Art and Restoration “Palazzo Spinelli”. She specializes in paintings and Art on Paper. She works as an assistant Conservator at the RijksMuseum Twenthe in The Netherlands. She works between Holland and Florida where she collaborates with Art Conservators Lab. Miss Tamborini has a MA in Art History and an art conservation degree from The Institute for Art and Restoration “Palazzo Spinelli”. Her specialties are Work of Art on Paper and Textile conservation. She worked at the Palazzo Mansi Museum in Lucca, Italy. She also works as a visiting conservator at Art Conservators Lab in Florida. Ms. Huisman earned a BA in Humanities and Fine Arts from Florida International University, and is currently preparing to attend a conservation graduate program. She has participated in seminars at London's Rare Book School and at the San Gemini Preservation Studies Program in Italy. Ms. Huisman has worked in archives and document conservation at the University of Miami's Richter Library, and currently assists as a technician at Art Conservators Lab.